There She Goes! | Phil – Refuelled! As some of you already know, I have a weakness for all things steam. Well, back in the days of school metalwork, after completing my ‘set pieces’ I decided I wanted to build a small stationary steam engine. Luckily, I had support from the teacher and others. Cutting a very long and involved story short, I completed one in about a year’s worth of lessons and some extra time in the workshop whenever I could. And so the great day came to test it. The boiler was filled with water. As we had no methylated spirit at school, a Bunsen burner was used instead of the spirit burner I had made. After a few minutes, bubbling noises issued from the boiler. The piston rod moved slightly, then stopped at the end of its stroke. 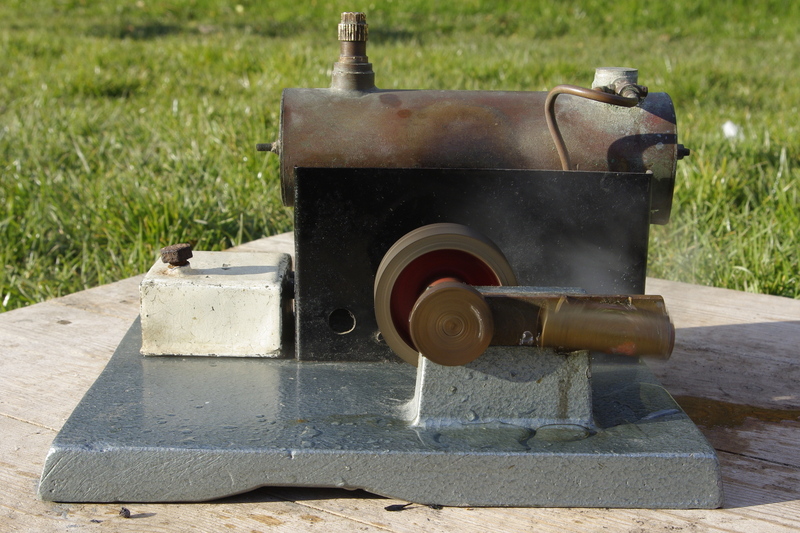 After a flick of the flywheel, the engine spluttered out condensate… and picked up speed! Now, of course, technically speaking, there was no reason why it shouldn’t have done. But, to a lad not long a teenager, there was a ‘what if’ factor; so this was indeed a magic moment. Ah… Methylated spirit fumes on the spring air! It quite took me back, I can tell you. One day, I’d love to make a bigger, better one. Maybe I will. But the first run will be no more – but, perhaps, no less – a magic moment than that first test run all those years ago. aww Phil this is fab! I, would of loved to see this. We do love a steam trains in this house and cant wait for our first train ride with Joshua! I shall clean it up soon (I hope) and take some more photos! What a lovely story. How many teenagers these days would be motivated to do something like this? Probably none! Too busy on their iPhones. Not a trace of CAD/CAM in sight! You drew things with a pencil and a geometry set, then made them using hand tools and manually-set machine tools!